Previously, I was simply following the order of the textbook we were using for math but I found that R found it boring and I don’t want her to hate math like I did at school. So we no longer follow the textbook order or only use a textbook. For this year, I’ve separated the year into monthly math topics. Then each week I choose different resources to teach that concept. Sometimes she’ll do some exercises from the core book we’re using (Galore Park) and I’m trying to use other resources too. We then discussed temperatures on a thermometer and after that she did a few exercises on negative numbers. I’m currently in love with Anchor charts from the US as a tool for learning. So she’ll be designing one for herself about negative numbers and the rules for adding and subtracting negative numbers. Each day R has math I start off by giving her some mental math exercises as I feel she needs to keep on top of certain math concepts aswell as getting those brain cells working! We tend to wrap up math with some time on Mathletics. For the boys we’re currently working on learning numbers 1 to 30, recognising them, writing them, counting from 1 to 30 in 1s, 2s, 5s and 10s. We’re also going to look at greater than and less than and some basic fractions work. 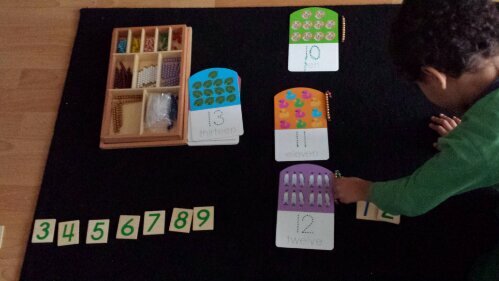 We use the montessori units and tens wooden cards and number beads. As I only have one number 10 card we use the teen number wipe off cards too. 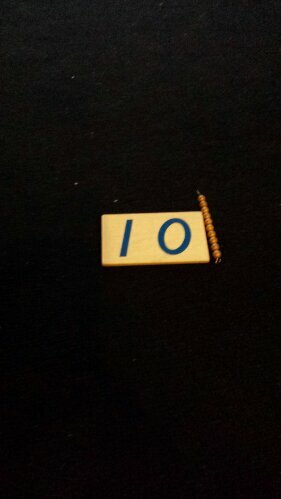 I start off by showing the boys the number 10 card and then recap that one row of gold beads is 10. I then take one of the unit cards like number 2 in the above picture and place it over the unit zero on the number 10 card and say ‘ten and two is 12’. This is so they understand that the teen numbers have a base of ten and a unit number. 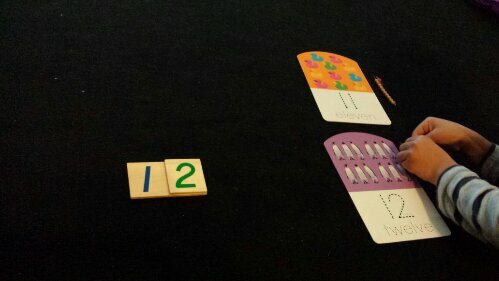 I then made number 12 using the montessori number beads and placed it next to the card. 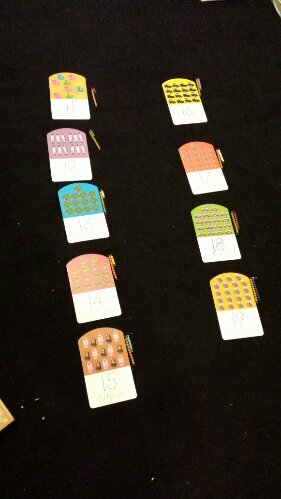 Once I showed them a few, I put everything back and they independently repeated the above for each number. Rather than simply teach them the number through recognition, this helps them to understand place value. Once they’ve completed all the numbers, I then do a random test such as ‘put your right hand on number 14, give me number 18, what number comes after 12’. I can only do one son at a time so whilst one is doing a hands on activity like the above one with me the other is using Mathletics. I find that my boys need hands on methods to learn new things and the montessori method is perfect for this.